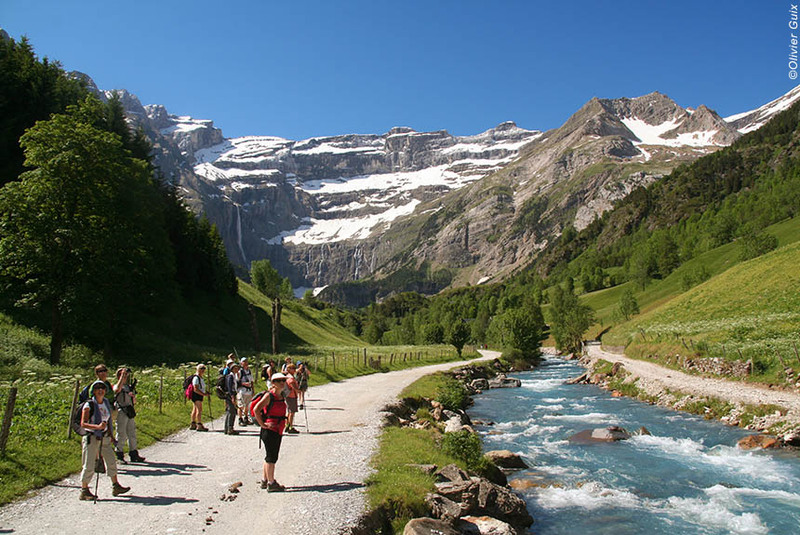 Majestic mountain scenery and truly memorable walking including the UNESCO Heritage site of the Cirque de Gavarnie. 8 spa treatments included. Stay in a comfortable hotel in an authentic mountain village. Enjoy guided walking with a bi-lingual guide. You'll return refreshed in mind, body & soul. 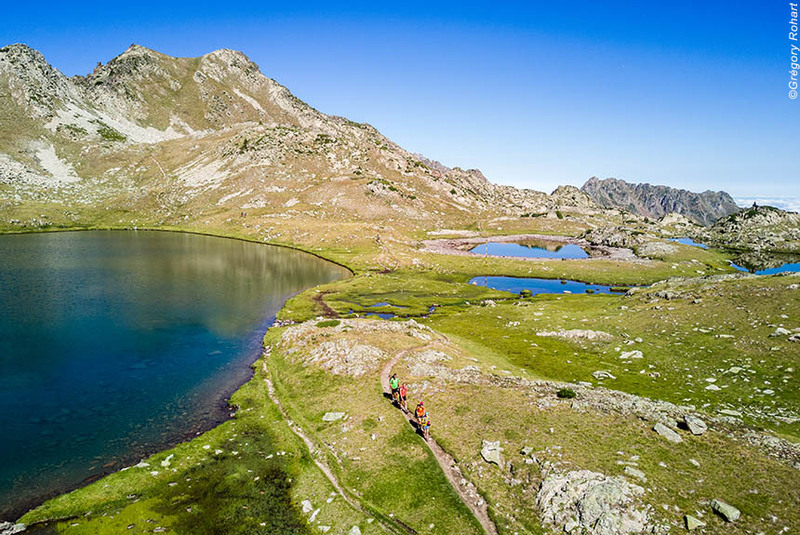 The French call it a cocktail of health, and we think that there's no better way to feel good about life while getting healthier, fitter, toned up, relaxed and beauty treated than a week in the beautiful, sunny, warm Pyrenees. You'll walk. You'll talk. You'll have spa and beauty treatments. You'll eat well. You'll stay in a really comfortable hotel in an authentic mountain village. You'll meet great people, and you can even practice your French if you want to. Now if that's not a cocktail for health we don't know what is! We meet you at Lourdes airport (flights from London 4 days a week), or railway station (fast trains from Toulouse), and transfer you to your three star hotel in Lourdes for the first night giving you time to explore this interesting historic city. The three star Hotel Beausejour has evolved from an 18th century mansion, and now offers all the contemporary comforts you would expect, plus lovely gardens with mountain views, a solarium and swimming pool, yet it is close to the historic centre and sanctuaries. A well designed brasserie style restaurant to enjoy as well. After a buffet breakfast (allowing you to be as healthy as you like), you meet up with your group - maximum 15, minimum 5 with a mixture of English and French speakers, and a bi-lingual guide. There is then a 45 minute private transfer up (and up) to where you begin your first walk to the magnificent Lac d'Oncet. It's a comfortable 3 hour introductory walk, yet you are deep into the Pyrenees walking beside streams on paths through summer pastures, and all the time in the metaphorical shadow of high peaks, not least the 9,400 feet Pic du Midi de Bigorre with a marvellous observatory on top (our Best of the Pyrenees journey - FP2PUPI - includes a night up there). After the walk, we take you to Bareges - a village in a wide mountain valley at over 4,000 feet that now has cafes, bars, thermal baths and views that make you feel good about life just being there. Right in the centre is the appropriately named and excellent three star Hotel le Central. It is a Logis de France hotel so promises traditional values and modern comforts. We are sure you will enjoy staying here for the week - and that's why we chose it from several other possibilities. You will dine in the hotel restaurant and in village restaurants, and have the generous buffet breakfast each morning. Walking time: 3 hours. Elevation: + 450m / - 450m. Transfer time: 45 minutes. Today it's a post-breakfast transfer, then the unforgettable Cirque de Troumouse. It's a huge glacier-created natural amphitheatre 2.5 miles wide at an average altitude of over 7,000 feet with streams and waterfalls, wonderful paths and surrounded by cathedral like spires of peaks rising to nearly 10,000 feet. It's got the lot! You take a circular route that takes you around la Munia peak, alongside the series of ponds, and through delightful Alpine pastures with wildflowers that will please you, marmottes that will make you smile, and, if you are lucky (not very lucky, just lucky) isards, the Pyrenean goat-antelope clambering over precipitous slopes. On your return, there will be a presentation about your spa treatments, massages, thermal baths and options for a whole lot more - and, because you've earned it, your first pampering session. Included over 5 days are: 2 hydromassage baths, 2 thermal mud baths, 1 underwater massage, 1 jet shower, and 2 hydrotonic salt baths. Walking time: 5 hours. Elevation: + 600m / - 600m. Transfer time: 40 minutes. The Massif du Néouvielle is bigger (a 23 square km national park), higher (at over 10,000 feet) and crowned with lakes (Dets Coubous and Nere to name but two), so makes for a wonderful day's walking, talking, picnicing, photographing and plain silence to absorb its harmonious beauty and high altitude tranquillity. The French call it a fairy tale area. We think its Nature at its very real best. Talking of which, there's another relaxing treatment waiting for you on your return. BTW: today you start and finish the walk with a short transfer so you avoid a boring section of road. Walking time: 5 - 6 hours. Elevation: + 750m / - 750m. 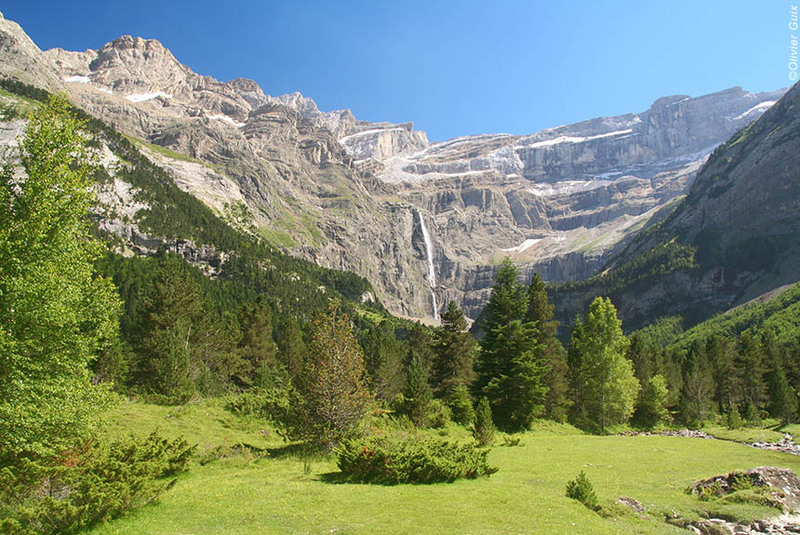 Right, so this is a world class experience - the UNESCO Heritage site of the Cirque de Gavarnie, the premier attraction of the whole Pyrenees, and better than anything in the Alps (but we would say that, wouldn't we?). More than any other, it is a "cirque" as you are surrounded by sheer cliffs rising 3,000 feet above you topped, early season, with snow and with snow patches all year round. There are several (and after rain dozens of) waterfalls, any one of which would be famous in its own right, but what makes it all the more delightful is that your guide will take you on easy walking paths that deliver peaceful panoramic views. Even without a camera you'd always remember them. A spa treatment of your choice after your walk, and before your dinner. Both well earned, and, we trust, greatly enjoyed. Walking time: 4 hours. Elevation: + 500m / - 500m. Transfer time: 35 minutes. 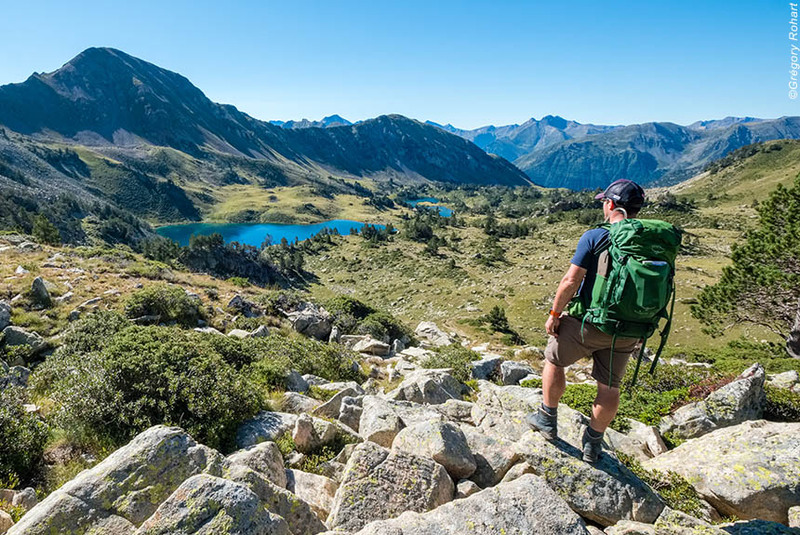 Your walk today begins in Bareges, and takes you up through delightful pine woods, across Alpine pastures dotted with traditional stone barns and shelters occupied in summer by shepherds (some still so these days) to the wonderful Plateau Lumière. It feels like its lost in time, and in many ways it is because little or nothing has changed in hundreds of years. Just as you could have in the 18th century, you can look up to the granite peaks of Ardiden, and down to the slate rooves of the stone cottages in the hamlets and villages far below before gently descending at your own pace to Bareges where another treatment awaits you. A bucolic day. Walking time : 4 hours. Elevation : + 450m / - 450m. You're fit. You're healthy. You've been pampered too, so you're ready for the Massif du Néouvielle, and the superb La Glère valley. You start with a short minibus ride from the village, and climb a little higher (so also descend a little further) than the other days, but we are sure you will think it well worth it to experience this high altitude peacefulness and totally unspoilt environment where you walk from lake to lake below the sky-touching peaks of Néouvielle and Turon. A last spa treatment before your final night out. Tonight, or perhaps another evening, you will dine at our favourite auberge in the region in the middle of a pine forest: Chez Louisette. A great ambiance. Quality food for carnivores and vegetarians. Lots of it too. A wonderful way to celebrate new friends and the end of of great trip. Walking time: 5 hours. Elevation: + 800m / - 800m. After breakfast and sad farewells, we transfer you to Lourdes airport, or the railway station. We will meet you at Lourdes airport, or railway station. After breakfast on the last day, we will transfer you to Lourdes airport or railway station. This holiday features mainly comfortable, but some challenging walking, so is suitable for people who are reasonably fit, and used to walking (albeit "gently") for much of a day. All you need to carry when walking is a daysack with whatever you regard as essentials plus water and your picnic (provided on each walking day). You will eat well. Dinners are based on set menus featuring regional specialities. 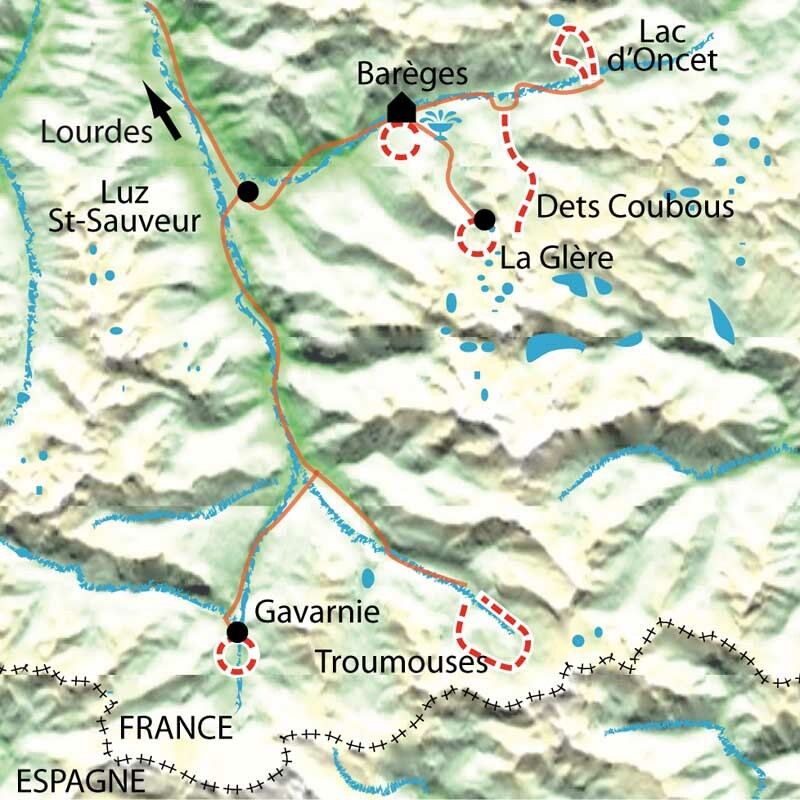 Dinners may be taken in the hotel, in village restaurants and one evening at Chez Louisette at the decision of the guide and the Purely Pyrenees management. Picnics are provided on each walking day.